Text & Photographs By Diane Krouse © All rights reserved. I don't know about you but I tend to get single-minded and narrow focused when I am planning a photo shoot. I want to get the big "opportunity" and tend to overlook the small ones. 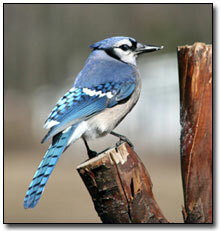 There are simple and sometimes easy ways to take pictures of birds in your yard. One can take pictures through a window of the house. You can set up a bird feeding station near the window. For instance, I have a log about 2 feet from my window. The log is set one end up and on that I put some peanut butter on it and some seeds and nuts. 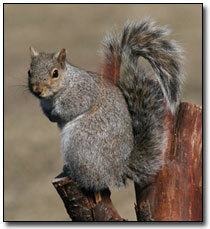 I also drilled holes in the side of the log for suet or peanut butter. This setup attracts downy woodpeckers, titmouse, chickadees, whitebreasted nuthatches, squirrels, and chipmunks. If it is a nice day outdoors, I will sit out on the porch, camera in hand, watch for birds in the trees and feeding stations. I have a lot of trees in my yard. 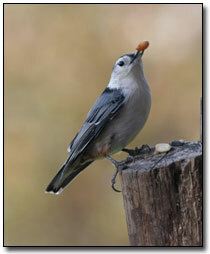 The birds like to hide there and they also grab a seed or nut and fly back and forth from the feeder to the trees. I also have a little pond, which Mallard and Wood ducks take advantage to swim and eat. The pond also attract turtles, frogs, dragonflies as well as Great Blue Herons. You can set up your camera on a tripod in front of the window with a remote control and your camera pre-focused on a specific spot. That way, you minimize your movements so you don't scare the birds and it also makes for sharper pictures.